Striker Chris Martin is targeting more goals after becoming the first player in 18 years to score 20 in one season for Derby County. Dean Sturridge was the last Ram to achieve the feat, firing the club to Premier League promotion in 1995-96. 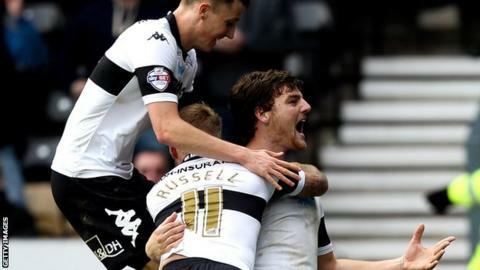 Martin's milestone goal helped Derby fight back to beat Blackpool on Tuesday and move to third in the Championship. "Twenty goals is a nice touch, but I've got personal target that I still want to reach," Martin told BBC Radio Derby. Chris Martin on Craig Bryson. "It is a little surprising that a club the size of Derby has not had somebody to score 20 goals." Martin struck inside three minutes at Bloomfield Road, levelling after David Goodwillie gave the Seasiders the lead after 20 seconds. The ex-Norwich striker, who scored twice in 13 games for Derby last season before joining the East Midlands club on a permanent basis in May, was more concerned with the importance of his latest goal. "It's more a label, the 20-goal-a-season man," said Martin. "I'm delighted to get another goal that meant something. Some people get 20 goals and sometimes those goals don't mean an awful lot. "I think a lot of my goals have contributed to good wins for the team, draws and points. "It was quite an important goal to get us back into it and I think we showed great character having gone behind so quickly." Midfielder Craig Bryson, who has this season reached double figured for the first time in his career, completed the 3-1 win against Blackpool with a solo effort. It was Bryson's 16th goal of the season and ensures that Martin will be keen to keep the goals coming this term. "It's a running battle [to finish Derby's top scorer] and he won't go away," said Martin. "That has spurred us on a little over the course of the season because we have both had a few words in each other's ear. "It's good friendly banter and keeps us motivated to keep scoring more goals. "I'd be delighted to see Bryso get to 20 as well, that would be some achievement for a midfielder."